Color changing LED Wheel Well kit will enhance the look of your wheels.. 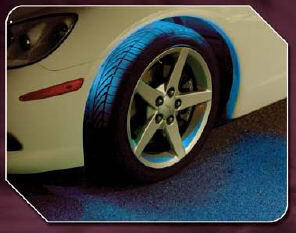 Enhance the look of your Cars "Wheel Wells" by installing a Color changing LED Wheel Well kit! Color changing LED Wheel Well Kit. Tired of the dead space in your wheels with your under car kit? PlasmaGlow brings you the perfect addition to your existing LED lights, the Color Changing LED Wheel Well Kit! The Kit includes enough tubes to do all four wheels, and just plugs into your existing 2.1 Million color LED Digital Control Box (required). No extra wiring, or twisting wires, simply mount, plug-in and go! Kit includes: Lifetime Warranty, distribution block and 8 LED tubes. These led lights for wheel wells mount above your tires in the wheel wells to provide glow where it has never been found before! High impact casing make this a low maintenance addition, easy to install on ALL vehicles! All you need, in order to run these Wheel Well Kits, is a 2.1 Million color LED Digital control box *OR* a 2.1 Million Color changing LED Under car Kit, (which already has the 2.1M color Digital Control Box in the kit), and your ready to go! Or, you can purchase the LED Wheel Well kit & a Digital Control box as a "Combo pack" and SAVE! Color changing LED Wheel Well kit- Back to Home page.